Happy Tuesday! Thank you so much for your kind feedback about the launch of Coffee & Tacos – I’m so grateful that you’re along for the ride. I’m going to test out a series idea every Tuesday called Taste & Try. Each week I’ll alternate between featuring a recipe and a restaurant, all of which I’ve tasted and tried myself. I love food oh-so-much that, when dreaming up this new blog format, I knew that I’d need to schedule a weekly post dedicated to two of my very favorite pastimes – tasting food at delicious restaurants (both Dallas-based and beyond) and trying out new recipes (typically with a glass of wine or a fun cocktail in hand). 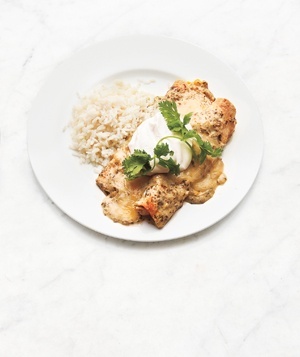 So, in the spirit of yesterday’s Cinco de Mayo celebrations, the first recipe features a Tex-Mex show-stopper – Chicken Enchiladas Verdes. Mom sent me this recipe, which she tore out of Real Simple Magazine, and already it’s become a Brown family favorite. These aren’t the healthiest treats on the block but James and I made these last week and, despite my constant cravings for them, I resisted sneaking bites straight out of the fridge and we had these for dinner for four whole nights, reducing the suggested number of servings and spreading out our sour cream intake just a bit. We skipped the rice, as the original recipe suggests, and opted for an arugula salad with lemon vinaigrette. I think you could use a rotisserie chicken instead of the bone-in breasts, but I just a little more proud of the dish when I cooked the chicken myself. The enchiladas pair deliciously with margaritas, of course. Heat oven to 400 degrees. Place the chicken in a medium saucepan, add enough water to cover, and bring to a boil. Reduce heat and simmer until cooked through, 15 to 20 minutes; transfer to a plate and let cool. When cool enough to handle, shred the chicken, discarding the skin and bones. Place the meat in a large bowl. Meanwhile, in a blender, puree the salsa and 1/2 cup of the sour cream until smooth. Transfer to a small saucepan and simmer until slightly thickened, 10 to 12 minutes. Stir in the remaining 1/2 cup of sour cream. Add the corn, 1 cup of cheese, 1/2 cup of the sauce, and 1/2 teaspoon each of salt and pepper to the chicken and combine. Spread 1 cup of the remaining sauce in a 9-by-13-inch baking dish. Roll up the chicken in the tortillas and place seam-side down in the dish. Top with the remaining sauce and cheese. Bake until bubbling and beginning to brown, 15 to 20 minutes.